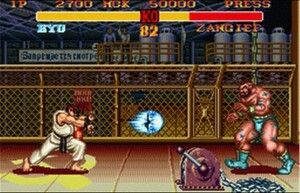 Capcom releases Street Fighter II Turbo: Hyper Fighting for the Super NES in the US. The Street Fighter II arcade game started the fighting game boom of the 1990’s, which spawned off other many other fighting game franchises such as Mortal Kombat and Virtua Fighter. The Super NES version brought Street Fighter II into the home and … um … college dorms where certain people spent many hours smacking down their dorm mates. I still have this game so if anyone is feeling saucy, the smack downs can resume at any time.